I was never really a big fan of banana bread as a kid, but boy, oh boy, I can’t get enough of it now! 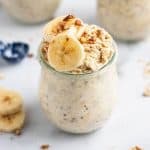 Banana Bread Overnight Oats, granola, banana cake, you name it, I am game! This recipe pretty much seals the deal for me. 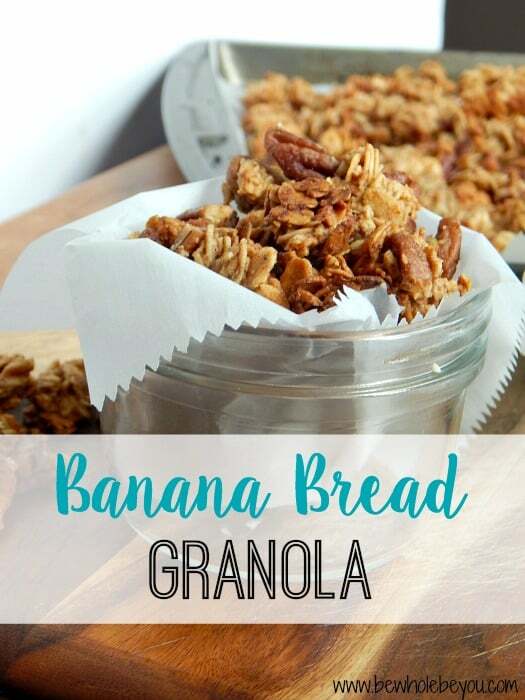 I licked the bowl clean as I made this Banana Bread Granola because it’s just as good before it’s baked! 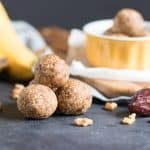 Summer time is here and while warm comfort food is not always top of mind, quick and easy snacking usually is. Whether you are heading to the zoo, the park or the pool this summer, a stash of this granola will satisfy everyone’s empty bellies. This recipe can be made gluten free as well as vegan. This is great plain or on top of yogurt, a smoothie bowl or even a bit of vanilla ice cream. The sweet crunchiness won’t last too long though so you may just need to make two batches at a time. 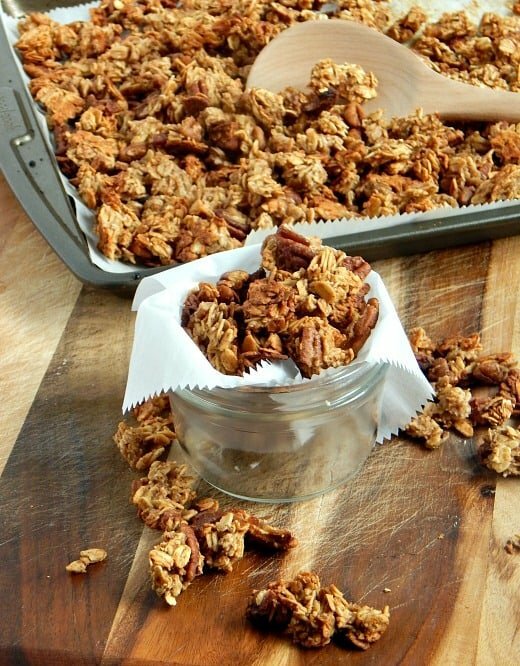 For the price you pay for a small bag of granola at the grocery, you could make several batches on your own. You also get to control what goes into it. What does that mean? Whole, real food ingredients are going into the mouths of those you love the most. So you can have peace of mind that you are snacking the right way! Puree banana in food processor or blender. In a mixing bowl, combine pureed banana, vanilla, maple, and apple sauce or coconut oil. Stir well. Add in cinnamon, sea salt, and oats and stir to fully coat oats. Spread mixture evenly on a baking sheet lined with parchment paper. Bake for about 24-27 minutes or until golden brown. If you like your granola chunky and in big clusters, do not stir halfway through baking time. 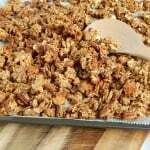 If you prefer smaller pieces of granola, stir or shuffle mixture a bit halfway through baking.